How to Plan a Trip to Ladakh in April? When you talk about the tourist season in Ladakh, I believe it is the month of April that marks the beginning of it. As winter beings to fade away in April, locals prepare for the upcoming tourist season; and thousands of people from all over the country get ready for the trip they had been planning on for so long. With the changing weather, all the snow that has been blocking the roads at high altitude passes starts to melt; and BRO works rigorously to open them all as early as possible. The month of April may not be called as the best time to visit but there are certain charms and benefits that only this month can offer you. What those are and how you can plan your trip to Ladakh in April is what I will provide details on further in this article. The first and the most important thing here to know is that a road trip to Ladakh in April highly depends upon the weather conditions. For example, this year the Srinagar Leh highway was declared open in last week of March itself because it did not snow much anywhere. On the other hand, in 2017, it had snowed so heavy that even the Srinagar route remained closed until early May. So before you finalize your plan, wait until at least mid of March to get an update on road opening. The route from Srinagar usually opens towards Mid-April so if the reports are of a timely or early opening, you may travel by road. If there is any chance that it may get delayed; then at least keep your plan flexible enough to be pushed towards early May. Another important thing to know is the requirement of getting an inner line permit. Ladakh, due to its close proximity to china border is considered a part of Inner line; and hence getting a permit from DM office Leh is mandatory in order travel towards areas like Nubra valley, Pangong Tso and Tso Moriri. This permit can either be obtained in person or applied for online. To know the complete procedure of getting this permit and related charges, please take a look at the article below. The answer to this question is a definite yes but can also be broken down further with a few conditions applied. If you mean in terms of road connectivity to Manali and Srinagar, then yes it may be open towards end of April. All internal roads however in Ladakh are completely open in April including the ones towards Nubra valley and Pangong Tso from Leh city. In terms of accommodation as well, Ladakh remains open in April and you will have no problem in finding a place to stay. Leh Ladakh in the month of April will still be cold. It will not be on the extreme side like in the months of peak winters but temperature at nights will still fall below zero. Days will be pleasant with moderate temperature accompanied by cold wind but nights will still be quite harsh. If a road trip is on your mind then you must keep your plan towards later part of April, possibly in 3rd or 4th week; and this too will depend on whether or not the road is open. If you must travel in initial part of the month, then your trip would have to be planned by Air only. In first two weeks of April, chances of reaching Ladakh by road are extremely rare unless it did not snow much anywhere like it happened this year. If you reached Ladakh by Air, then acute mountain sickness will be one of your biggest worries. Your gain in altitude will be huge in a matter of couple of hours and you are bound to suffer from Mountain sickness, at least on first day of your arrival. To know more in details on AMS and what its symptoms are, please read How to Handle Acute Mountain Sickness in Ladakh. Manali Leh highway of course would be closed in April and since the Srinagar route has just opened, it will be in its worst ever shape. Melting snow would have created numerous water streams and slush all across. Bad sections of the road will majorly be between Srinagar and Sonamarg. Worst section however will be between Sonamarg and Drass in form of Zojila. You will have to tackle a lot of mud and slush while crossing over Zojila at this time. Between Drass and Leh however, roads will be average with a few bad patches in between. After you have reached Leh, roads towards Nubra, Pangong and Tso Moriri will be a mix of good and average. Bad sections will be limited to the top of Khardung La and Chang La. Presence of snow and water streams creating by melting of it will however be in plenty on these routes as well. Public transport at this time will still be scarce since the region has just started to open up. You may not find any bus at all going towards inner areas of Ladakh from Leh city. Even if there is one available, the frequency of it will not be so great. Your only chance of public transport will pretty much be limited to shared taxis which you can find from Leh bus stand. Motorcycles however will be available for rent which can be a great alternative if you are unable to find a bus or shared cab at a desired time. You can rent a motorcycle from Leh city and travel as per your convenience. With the above being said, let me suggest a sample itinerary that you can follow for this trip. Your final plan will of course depend on how many days you have in hand but it should at least give you an idea on how to plan your journey. I will suggest the plan for a road trip as well as an Air trip. If reaching Ladakh by Air, below is the itinerary you can follow. This of course is just a sample itinerary but it is one plan that you can follow irrespective of your time and mode of travel. The connecting roads between Nubra, Pangong and Moriri may not be open in April in which case you will have to come back to Leh from each of these destinations. If you hired a motorcycle in Leh or a private cab, you can follow this itinerary but in case the connecting roads are open as well, then you can travel directly between Nubra and Pangong via Shyok road; and Pangong and Moriri via Chushul route. If however you were looking for a bus or shared taxi, then you will have no other choice but to return to Leh city every time. There is still no public transport available on Shyok road, across Wari La or Chushul / Hanle route. If you were planning a complete road trip to Ladakh, below is a sample itinerary that you can follow. For the sake of this article, I will assume Delhi as the starting point. You will of course have to reach Ladakh via Srinagar and come back the same way because Manali Leh route will not be open in April. Following this itinerary, when you reach Leh from Kargil on Day 4, you will do so via Lamayuru. But on your way back on Day 9, you can chose an alternate route via Batalik. However, please note though that a permit is needed to travel on Batalik route; so ensure to add this name on your ILP application form. In case Shyok road is closed at your time of arrival then you will have to return to Leh from Diskit on Day 7; and go to Pangong on next day. If you have more time in your hand, then you can plan a trip to Tso Moriri as well; either from Leh via Chumathang or from Pangong via Chushul. The bus service from Srinagar to Leh starts sometime in May after BRO declares the road as safe enough for a bus to ply. This service remains unavailable in the month of April. If you want to travel by public transport, then your only option is to find a shared taxi or rent a motorcycle from Srinagar. For a brief overview, Leh to Nubra valley road will remain open in April; and so will be the road from Leh to Pangong Tso. The connecting road via Agham Shyok villages may or may not be open. The road across Wari La will definitely be closed. Chushul route will remain open in April but for Indian citizens only. The direct road from Leh to Tso Moriri via Chumathang will be open; but the one via Tanglang La and Tso Kar may remain closed throughout April. Majority of the hotels and guest houses will remain closed in early April; both in Leh city and other areas of Ladakh. If you were planning a trip in first week or 10 days of April; the I will suggest that you call and book in advance. Towards second half of April however; a lot of hotels are already functional and you will have no trouble finding a hotel and negotiating an on the spot deal. The same logic applies to other places like Srinagar, Kargil, Sonamarg and Drass as well. Due to initial part of the month, temperature at night will go below zero; but days will be around 10 degrees Celsius. As the month will progress; day temperature will hover around 10 to 15 degrees Celsius; but nights will still remain close to zero. Visiting Ladakh in April means that you are traveling early in the season. If traveling by road from Srinagar, then bad road conditions and unpredictability will be your biggest challenge. You are bound to face some really bad sections of the road, Water crossings, slush. BRO continues to work on the road in April and temporary closures are not surprising at this time. If that happens, then you will be stuck or stranded unless the road is opened again. If flying by Air, then Acute Mountain Sickness will be your biggest challenge as I described previously in the article. Limited accommodation choices will remain to be a challenge in both the cases. If you want to make it a road trip to Ladakh then there are two things you will have to keep in mind and both will heavily depend on the weather. The first is that you must plan towards later part of April. And second is that you must plan only via Srinagar. This too however can only happen if the weather was favorable and Srinagar Leh route was declared open in April that year. Manali Leh highway usually opens by late May or early June and there is no way you can travel on it in April; so you would have to keep it out of your itinerary. 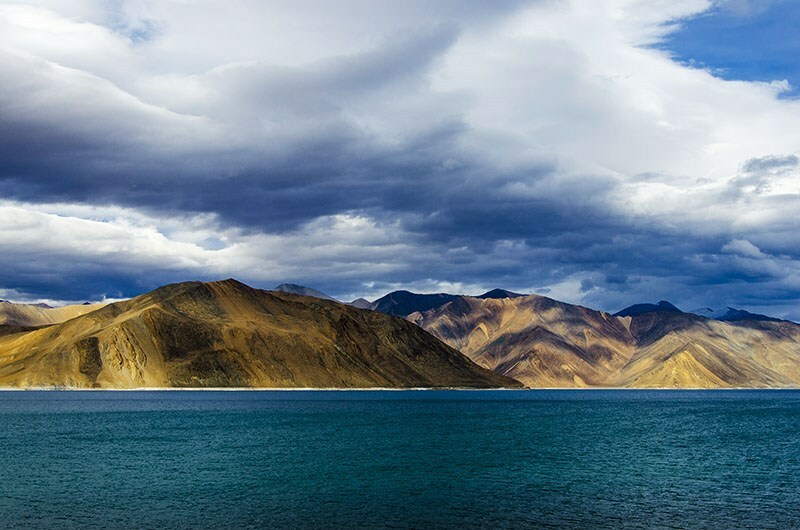 Once you reach Ladakh though, all the other areas like Nubra Valley and Pangong Tso remain accessible by road and you will be able to visit all of them. Historically, Srinagar Leh highways opens towards Mid to Late April but this depends entirely on the snow and how fast BRO was able to clear it. There have been instances when the road remained closed well into May; and there were years when it got opened in March itself. If you must plan your trip in April only, then keep a close watch on the weather forecast and keep yourself ready that you may have to cancel your plans at the last minute as well. If you were in luck though and the road did open in April then you must remain prepared for 2 things. First is that the condition of the road will be terrible. Second is that there could be a temporary closure as BRO will work rigorously in first few weeks of opening to stabilize the road. If there was a temporary closure, you will be stuck in the nearest town and will have to wait it out until BRO restores the connectivity. Traveling on Manali Leh Highway in April is a complete no as the road remains closed for civilian traffic. The farthest you will be able to reach from Manali is Lahaul valley, provided that Rohtang Pass was declared open. Otherwise you will be sent back from Gulaba check post itself. Several hotels in Ladakh get operational by April these days so you will have no problem finding a place to stay. Whether or not to book in advance is a personal choice entirely. If it gives you the peace of mind, you may call in and book a room; otherwise you could just arrive here, find a hotel per your liking and negotiate an on the spot deal. Remember that the month of April is still winter in Ladakh and the temperature would still remain close to freezing point, specially towards the early part of April. As a direct result, water pretty much freezes everywhere including the pipes which means that there may not be any running water at all. Hot water will be provided to you in buckets and you will have to use that conservatively. It also means that you may have to go without a shower for a few days and if that is not OK by you, then maybe you should not visit Ladakh in April at all. You may be able to find an expensive hotel in Leh city that will provide all the necessary facilities; but in areas like Nubra, Karzok and Spangmik, hot water is still a luxury in April. In terms of sightseeing, you are free to visit any of the local areas in Ladakh. All of them remain accessible by road and depending on the time you have in hand, you can include as many places as you like. The only hitch in the plan could be if you were traveling in early April and if it snowed at any of the passes en route; closing the road temporarily. Nubra Valley remains open in April completely. The critical road to Siachen runs through Nubra valley due to which, Indian Army keeps it open all year long. Even if it snowed at Khardung La and the road shut down for a while, BRO will clear it and restore connectivity as soon s they are able to. You will be able to visit all the local villages like Diskit, Hunder, Turtuk and Panamik. In terms of accommodation however, I would recommend that you plan staying at Diskit for the night. The direct road from Nubra to Pangong via Shyok will not be accessible in April so you will have no choice but to return to Leh and then plan for Pangong the next day. If you were hoping for a completely frozen Pangong Lake, then chances are that you will not find it so in April. The Lake freezes completely in February but starts to melt towards the end of March. By April, it is more blue than white. Good news however is that you will be able to visit here with no problem at all unless it snowed at Chang La and the road got closed temporarily. In terms of accommodation, camp sites may not be available in early April, in which case, you will have to stay as a paying guest at Spangmik. Towards end of April though, camp sites too will be operational and you will have no problem finding a place to stay. Like Nubra and Pangong, Tso Moriri too remains open in April but it too will not be in a frozen state. Your chances of finding accommodation here are actually even better than at Pangong. There are two ways to look at it. If you were hoping to catch a live snowfall in Ladakh in April then your chances are brighter if you went in early part of the month. At this time, there will be good amount of snow on the ground, at the passes and along the routes. If you were lucky, it may even snow while you were still there. But if you went to Ladakh in April end, then chances of a snowfall are much less. If you were however thinking about finding snow on the ground; then you can go in any part of the month and will still find plenty of snow at the high altitude passes. There will be no snow in the lower areas like Leh and Nubra Valley though. April really marks the beginning of tourism season in Ladakh so there will be quite a few of people around. There are hospitals in Leh city that will remain open in April. Apart from the hospitals, you can also approach Indian Army as well for medical assistance. Hospitals however are only limited to Leh and Kargil only. There is no medical assistance available at Nubra, Pangong or Tso Moriri for anything serious. If you have a medical history involved; or traveling with a child or your elders; then I would strongly recommend that you get a doctor’s advice before finalizing the trip. Camp sites in April will mostly be limited to either Pangong or Tso Moriri. There will be no camp sites at this time on Srinagar Leh route and Manali to Leh will be closed anyways. However you can definitely pitch your own tent if you were carrying all the necessary gear. Just make sure you bring in the best quality sleeping bag to keep you warm in below 0 degrees temperatures. You can also rent the camping gear and sleeping bags in Leh city as well. While self camping, please do not do so in the middle of nowhere. Try to pitch your tent close to a chadar tent or a Dhaba. You can pay them a little to give you a spot. This will also be beneficial in the terms of meals since you can then eat at the Dhaba itself and wouldn’t have to worry about cooking on your own. You can also pay a little extra to use their washrooms as well. For some more tips on camping in Ladakh, please take a look at the article below. This actually applies irrespective of your time of travel. A trip to Ladakh will always have a bit of uncertainty factor to it. You may be visiting Nubra Valley or Pangong and the road across Khardung or Chang La may get snowed out; forcing you to stay back for a day or two. Or BRO may close any other road for temporarily if weather closed in or for restoration purpose. To handle it better, you should plan your trip in a way that if you had to extend your stay in Ladakh by a couple of days; you would be able to do so without any problem back home. You will really need to bring a mix of cottons and woolens for this trip. Just make sure that you are packing clothes that can be worn on top of one another; in layers. So if you were feeling warm, then you can just remove a layer or two per convenience. And if you started to feel cold, then you could just add a comfortable layer of clothing without making it too heavy or hot. Pair of thermals, followed by regular cottons, light woolens and a heavy windproof and warm jacket will do the trick. Make sure that your jacket also has a hood that can cover your neck and head. Good quality shoes, gloves and socks will of course be necessary. Some other helpful items can be a pair of sunglasses, lip balm, cold cream, moisturizer and some regular cold, flu, stomach ache, headache medicines. Yes, a lot of people have now started to consider Ladakh for their honeymoon as well. If you were thinking that too then my answer is yes you can do it. Weather will be pleasantly cold and there will not be too many tourists around; making it a perfect place to plan for honeymoon. Just make sure that you call your hotel in advance, book your stay and inquire about facilities like hot water; because I am sure squatting every morning over a dry pit on your honeymoon isn’t what you would want to do. Can we visit Leh Ladakh in April? The answer is that yes you definitely can. Just keep in mind the tips I mentioned above and I am sure you will have a really great trip. I hope the information above on planning a trip to Ladakh in April was of help. If you have any further questions; or have any doubts about your trip that you would like to clarify; please feel free to ask in the comments section below; or at our Community Forum; and I will be glad to assist. Hi, i am planning a Leh trip in the last week of April. I would like to know your opinion, is it safe to plan a trip now, considering activities happening in the north in last 3 months. The details provided are great! Thanks for the itinerary! However i would like to know if self-driven cars and bikes are available in Leh during 2nd week of April, also is it safe to drive on those roads during that time. Any references regarding the renting points will be highly appreciated. Hi Pooja – You can get motorcycles on rent but self drive cars are not an option in Ladakh. There may be some snow on the roads in early April at top of the passes but should be manageable. Hi. Any recommendation for a good hotel, a guide/agent based in Leh Ladakh? I’ll be travelling to Leh Ladakh this midweek of April for 7days approx. You can talk to Rohit Mishra in Leh at 9910 722 252. Hi. I m planning to visit Leh Ladakh at the end f March or 1st week f April wid my friends.. Plz let me knw during dis period can i cover Nubra valley, khardunga pass, pangong lake?? Wil dis b open as me coming from Kolkata by air. ?nd we r total seven people including six yrs baby boy.. So wil dis b fyn to travel wid a kid?? Yes you will be able to visit all these places. For traveling with Children, please see the post below. Hi. I’m planning to visit leh ladakh at the end of March or very first week of April with my friends. Pls let me know whether the time is suitable for us as we will be going there from kolkata. Do we find hotel rooms and folding easier at that time. Yes you will be able to find hotels in early April. It will be very cold at that time so pack accordingly please. Hi,i’m a student. I’m thinkinh of going to Ladakh with my friends from 30th March to 7 April 2019(our only last holiday before we leave india permanently) I think we’ll go by air since i’m worried the road from manali to leh will be closed. However,during this time,will there be activities to do/are the scenery ok? Or do you think its not a good idea to go at this time at all? Really wish you can help us out as we heard that Ladakh is really beautiful and if possible,we would like to go there once before leaving India.